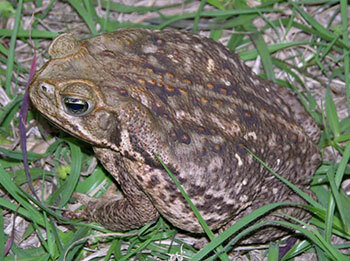 CAUTION: When this non-native species of toads is threatened or handled, it secretes a highly toxic milky substance from its large parotoid glands at the back of its head, behind the ears. This secretion can burn your eyes, may irritate your skin, and can kill cats and dogs if they ingest the secretion. Symptoms of Giant Toad poisoning in pets include drooling, head-shaking, crying, loss of coordination, and, in more serious cases, convulsions. The dog's (or cat's) gums often turn red, an indicator used by veterinarians to distinguish toad poisoning from epilepsy. For this reason, pet owners should be familiar with their pet's normal gum color. Treatment: If you suspect toad poisoning, get a hose and run water in the side of the dog's/cat's mouth, pointing the animal's head downward so water isn't swallowed. Rub the gums and mouth to remove the toxin. This treatment is usually successful, but call your veterinarian immediately.